I spent a lot of time physically in Manchester last year, for one reason or another. As a ‘Northern power house’, it happens to be only two hours away from London Euston on the train. Manchester has forced to me to think – in dementia policy – whether independent living is consistent with communities, and whether Manchester could help us here with the dementia friendly communities policy work stream in general. Independent living can be promoted through upholding of human rights (hence the reference to right based advocacy and the UN). When news of the ‘People’s Republic of Manchester’ was breaking last year, I remember the criticism that came with it from the NHS policy stream. That is, locally devolved powers might undermine the national nature of the health service. At worst, the devolved Manchester was also devolving blame for cuts to a local level. It’s possibly no coincidence that Phillip Blond has been involved with both the DevoManc agenda and the Big Society. In terms of the ‘Big Society’, one of Blond’s fundamental arguments can be interpreted as that ‘the left’ did not actually deliver on its communitarian politics. One of the central premises of the Big Society is that individualism is best served with an empowerment of people’s relationships with another. The effect of a monopolistic relationship with the State, or as more’s the case outsourced private providers, is that such relationships do not gain power. Coincidentally, it happens that one of the biggest criticisms of ‘dementia friendly communities’ is that it is in some way or other a ‘cover for cuts’. The problem was that, temporally, the Big Society surfaced at approximately the same time as the austerity-led agenda following the global financial crash. Whilst latterly there has been talk of care homes forming ‘community hubs’ as part of dementia friendly communities, it appears likely that a central thrust of dementia friendly communities, policy-wise, was to promote ‘independent living’. This ‘independent living’ rose to prominence from the disability movement. With the Prime Minister Dementia Challenge, there has been muttering on the spotlight received by dementia (even given the devastating cuts in social care), compared to disability (including the demise of the Independent Living Fund). Dementia is not a natural part of aging: that is why it has become important to separate the WHO ‘age friendly cities’ policy stream from dementia friendly communities, even though they show many commonalities (and to separate ‘independent living’ from ‘successful aging’). But it is nonetheless clear that there is some sort of relationship between the ‘health of the nation’ and resources the State has to play with. 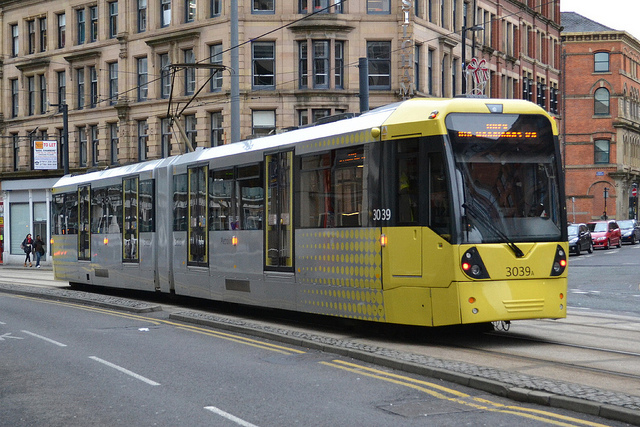 I am physically disabled, which is why I particularly appreciated the in-city tram service within the city of Manchester, which made it very easy for me to move around the city of Manchester. For the wellbeing of people living with dementia, there has been a growing realisation that integrated services go substantially more than merely health and social care (important though they are); they necessarily involve, for example, housing and transport. It is symbolic than the policy streams of ‘social determinants of health’ and ‘friendly cities’ or ‘friendly communities’ have maintained their silos both at national and international level. But, with growing realisation of international instruments such as the United Nations Convention on the Rights of People with Disabilities, rights-based advocacy is reaching another level. The use of the word ‘community’, especially given the devolved nature of politics recently, puts in sharp focus at what level ‘friendliness’ (however so defined) operates. Glenn Rees, current Chair of Alzheimer’s Disease International, has often commented on the ‘dementia friendly societies’ policy stream of Alzheimer’s Australia and the contribution of Ita Buttrose. Manchester throws up the question of ‘why stop at community?’ It might be that it is actually necessary to devolve national functions to a local level if only to empower individuals and us collectively. Devo-Manchester now has the opportunity to create the kind of dementia-friendly policies that people with dementia and their care partners have been demanding for a long time. These include respect for the needs of the individual, proper post-diagnostic support from an fully integrated service – not just health and social care but the whole range of community services and supports. The new policy must be based on UN Convention on the Rights of Persons with Disabilities (CRPD) which is a detailed charter of rights to which the UK government committed in international law in 2009 and for which it will be held to account by the UN Human Rights Bodies next year. The CRPD is the first international treaty in which those intended to benefit have played a full and equal part in its creation, implementation and monitoring. It’s not about what WE will do for THEM but Nothing About Us without ALL of Us. In ratifying the CRPD in 2009, the UK government has made a commitment in international law for which it is accountable not only to the UN but to its own people. Next year, it is the UK’s turn to face a very well informed UN CRPD Committee, 17 of its 18 members are people with a disability -but no one with dementia not because they’ve been refused but because their associations have not so far demanded a seat at the table.